I'm the inspector over the mine"
— They Might Be Giants, "Metal Detector"
In fiction, it's common to see people on beaches looking around for stuff using metal detectors. This often carries the stereotype (in Britain at least) of someone who searches the countryside hoping to find buried treasure. This is not as silly as it sounds, since hauls of artifacts made of precious metals are occasionally found in Britain, which is what leads to this kind of behaviour in the first place. It's technically legal (and landowners have a good incentive, since they're entitled to a share of whatever's found on their land) and there are even specific laws for finding buried treasure note it belongs to the crown, but the finder and landowner will be paid a fee from whatever museum that ends up taking it, however for obvious reasons it greatly annoys actual historians and archaeologists, who'd rather see the sites properly excavated rather than plundered. Frequently they'll also find unexploded bombs or artillery shells left over from one of the World Wars, sometimes to their regret. This trope is not limited to beaches. See also Metal Detector Puzzle when this occurs in Video Games. Occasionally seen in Beach Episodes. Note, that in Canada, the long-running TV series, Beachcombers has the starring character, Nick, in an entirely different version of this activity. Namely, it is professional lumber salvaging using boats to haul lost logs into the water for towing to timber companies looking to recover their lost materials. Kamome is seen doing this during the Beach Episode of Cyber Team in Akihabara. Apparently her Patapi is equipped with a metal detector. Beachcombing regularly serves as a Get Rich Quick Scheme in the Disney Ducks Comic Universe. Calvin does this in Calvin and Hobbes: The Series in order to find an easter egg hidden within a treasure chest. Yeah, I know the egg's made of plastic, but it's also in a treasure chest, which should have some metal on it. Parodied in Spaceballs, where Dark Helmet has his men literally comb a desert planet with giant combs. The scene is the current page image for Visual Pun. Col. Sandurz: Are we being too literal? Dark Helmet: No you fool, we're following orders — we were told to comb the desert, so we're combing it! In Revenge of the Nerds Part II: Nerds in Paradise Poindexter spent his time on the beach using one of these. 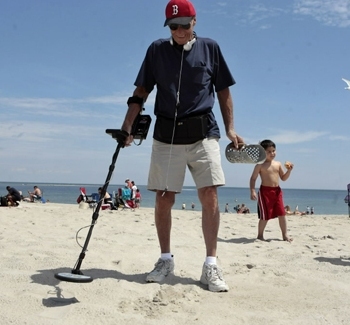 He finds a buried metal detector at one point. Local Hero: Ben, the local beach comber, becomes a huge plot point. Pacific Rim had an old man and his grandson looking for treasure on a snowy beach. All they find is a toy robot, and a real robot: Gipsy Danger. How a young Louis is introduced in Kangaroo Jack. In one episode of The Adventures of Pete & Pete, Dad explains that he met Mom when he was beach-combing and his detector went off at the metal plate in her head. In the same episode he tells this story, he's still combing the beach looking for something else really good..... and finds an Oldsmobile Cutlass Supreme! He and his family dig it out of the sand and drive home in it. Heartbeat: Claude Greengrass finds some Roman coins in a garden of a Big Fancy House he'd been hired to look after. He spends a fortune on a dredger in an effort to find the rest of them, only to discover them just as the owner arrive home to claim the lot. Midsomer Murders: In "Saints and Sinners", an archeological dig is searching for the bones of a local saint is threatened by a group of detectorists camped in the next field looking to raid the site for the trove the saint was supposedly buried with. Doctor Who: In "Resurrection of the Daleks", a local who is metal detecting on the mudflats is murdered by Lytton's fake policemen. British series, Detectorists, revolves around people who do this, all in an attempt to find treasure. In the Australia stage of Tony Hawk's Underground 2, there is a guy at the beach with a metal detector. From what he tells you when you talk to him, he's having no luck with his beachcombing. So, it's up to you to help him, by picking up cans from trashcans and giving them to him. Manny: Next beach I see, I'm finding me a watch. Saints Row 2 has a few beachcombers. Because of the random generation of civilians, they attempt to beachcomb on the wooden pier containing a few stores. The fourth case of the first Phoenix Wright: Ace Attorney game has Phoenix use (and carry around) a metal detector lent to him by Detective Gumshoe. First he uses it to find a clue, at the end of the trial he uses it to prove that Von Karma has a bullet in his shoulder from when he murdered Edgeworth's father. My Little Pony: Equestria Girls Digital Series: In "Lost and Found", Rainbow Dash and Applejack help Rarity looking for her lost earring with metal detectors. They end up digging a large pile of various objects. Amazing Super Powers has a beachcomber who found some "good advice" (see also the hidden panel). 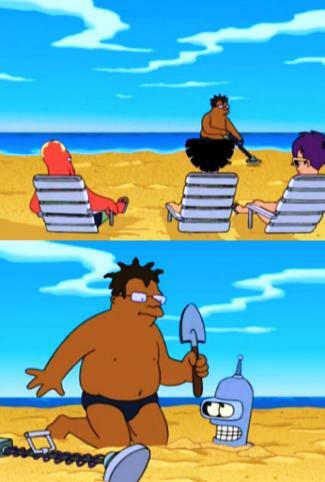 In the Futurama episode "When Aliens Attack", Hermes is seen combing the beach with a metal detector ◊. It turns out that he was using it to play hide and seek with Bender, though. On King of the Hill, Peggy and Bobby engage in some beachcombing when vacationing on the shore, and coming in conflict with local beachcombers who don't appreciate tourists horning in on their turf. In The Powerpuff Girls (2016) episode "Man Up 2: Still Man-ing", Buttercup spends much of the time searching for a rare bottle cap for her collection. In Gravity Falls episode "A Tale of Two Stans", this was Stan's first "job" after being kicked out of home, which he romanticized as treasure hunting. He gave it up when it became apparent that "Gold is some sort of rare metal" and became a Snake Oil Salesman. A recent example is this guy , who found the single largest stash of Roman coins in Britain. There have been several instances of Roman artefacts being buried on British soil, from the time that the Romans had attempted to invade. Another example is the Hoxne Hoard , found by a retired gardener in the Suffolk village of Hoxne. This served as inspiration for the song Eric the Gardener by The Divine Comedy. Similarly, a woman was prosecuted under the Treasure Act (which deals with finding and compensating artifacts with historical value) after failing to turn in a rare coin (1 of only 4 discovered to date). She was let off after it was revealed she had received it before the act came into law.